Indira Gandhi took charge in the mid 1960s, when India was at its most vulnerable moment economically and politically. The assassination of Indira Gandhi on October 31, 1984 was described by India Today then as the passing away of “a giant among pygmies” leaving the country in “shock, disbelief, anger”. How does one remember Indira Gandhi 34 years after her martyrdom, given the dismal current economic and political situation in India, a country she loved deeply? Not even her worst critics questioned her passionate love for the people of her country, or that she fought till the end for India’s ‘national’ interest. She was to make the ultimate sacrifice in the effort to keep the country together on a secular foundation. An assassin’s bullets may have shredded her frail body, but as she said in a speech in Odisha a day before she was murdered, “Every drop of blood that is in me will give life to India and strengthen it.” It did. Indira Gandhi in her speech in Odisha also made a strong plea for peace, non-violence and fellow-feeling towards each other, and for combating religious communalism, casteism, regionalism, and linguistic divisions. She argued for the necessity of keeping up a constant battle against these evils, or else we would lose our freedom. What use is this freedom, she said, if we did not achieve real sovereignty through self-reliance and learn to deal with external threats, if we did not remove poverty and bring social and economic equity to our people, if we did not worry about the kisan, if we did not tackle problems of unemployment and inflation, and bring education and health to all, particularly communities which have been denied equity for centuries. She spoke of fighting superstition and bringing about a scientific temper and committing modern science to the service of people. This, she said, was the dream of our freedom movement in which every section of India participated. She could have just as easily been addressing the issues of today. Indira Gandhi was in fact reiterating the ‘Idea of India’ as put forward by our national liberation struggle which, very simply put, envisaged an India which would build and protect its own sovereignty and oppose imperialism globally; an India which would be peaceful, humane, democratic, inclusive and secular and have a definite pro-poor orientation. An “idea of India” which Jawaharlal Nehru tried to implement in the newborn Indian state. A contribution that is today sought to be wiped out in a shocking manner. Such is the hate spread against one of India’s tallest leaders, that one responsible Hindutva functionary even rued that Godse killed the wrong man – he should have targeted Nehru. Today we are faced with a situation where the regime in power represents forces that were not only not linked with our national movement, but in fact acted as a bulwark against it, culminating in the murder of the father of the nation Mahatma Gandhi. It is not surprising, therefore, that all the values of the movement are today severely threatened. We are witnessing a concerted attempt to change the nature of the Indian state from an inclusive secular state to a majoritarian Hindu rashtra. Lynching of minority and Dalit communities on the grounds of what they eat, what they wear (including moustaches or beards), whom they love, how they worship or what slogans they ostensibly refuse to repeat, is rampant. Rationalists like M.M. Kalburgi and Narendra Dabholkar, who spent a lifetime fighting obscurantism in favour of scientific temper, are shot dead. Journalists like Gauri Lankesh, who dare ask questions and take up the cause of the oppressed, are eliminated. Even university students who raise their voices against injustice are jailed, and beaten up inside the court like Kanhaiya Kumar or the victims of attempted shootings like Omar Khalid. All this is happening under the umbrella of Hindutva forces. As Jawaharlal Nehru (a name you mention today at your own peril) had precociously warned, if fascism ever came to India, it would take the form of majority communalism. On the sovereignty front, we seem to be on the path of undoing our great achievements since independence. India’s ability to charter an independent path, independent of the super powers, even at a time when it was just a newborn state, economically and politically extremely vulnerable, was an example to the other post-colonial third world countries. Today, that independence seems to be rapidly diminishing. Self-reliance is given a burial when we withdraw from a contract which would enable us to make our own fighter planes in favour of a deal which only hugely enriches some; the Rafale affair is a glaring example. Economically, the country appears to be hurtling from one whimsical decision to the other. The only consistent position is crony capitalism of the worst order. Big business houses are permitted to make a killing based on government collusion, while others are allowed to get away with outright loot – literally run away with thousands of crores owed to public banks and other institutions. This at a time when the bulk of the Indian people are facing enormous economic distress, with indebted peasants committing suicide in their thousands. As growing inequality has reached obscene levels, the government has actually chosen to increasingly pull out of its role in supporting the poor through providing employment, education and health. Given this background, it may be rewarding to take a quick look at some aspects of Indira Gandhi’s legacy, to see how she dealt with what appeared to be insurmountable challenges. This is perhaps not the occasion to discuss her shortcomings. Indira Gandhi took charge in the mid 1960s, when India was at its most vulnerable moment economically and politically. The wars of 1962 and 1965, two successive monsoon failures of 1965 and 1966, a fall in agricultural output by 20%, high inflation rates rising from a low of 2% till 1963 to 12% annually between 1965 and 1968, with food prices rising annually at 20%, food stocks so low as to threaten famine conditions in some areas and a deteriorating balance of payment situation with very low foreign exchange reserves had placed India in a ‘begging bowl’ situation. Following soon after the economic crisis of the mid 1960s, there was the genocide in East Pakistan resulting in the huge burden of over ten million refugees (more than the total population of a large number of countries put together) taking shelter in India and contributing to the 1971 (Bangladesh) war with Pakistan. This was followed by two droughts of 1972 and 1974, the major oil shock of 1973 involving a quadrupling of international oil prices and hence of cost of oil imports, the oil shock of 1979 when oil prices again doubled and the disastrous harvest of 1979-80 caused by the worst drought since independence. (The recent hike in oil prices appears puny compared to this.) Taken together, the period appeared to present an almost impossible economic scenario, especially for a poor and backward country. These crises had significant political implications with regard to India’s external relations. For example, the United States chose the vulnerable moment of the mid 1960s, when India was critically dependent on her for aid, especially the food loans under the PL 480 agreement, to flex its muscles. A most humiliating ‘ship to mouth’ approach was adopted where food dispatches were made on a tonne-by-tonne basis to pressurise India to change her agricultural policy and her critical stand on Vietnam. US pressure during the Bangladesh war was an extreme example of trying to twist India’s arms. Also, with the setting in over time of the process of the decline of the societal cohesion that the national movement had generated, the fissiparous tendencies based on language, region, class, caste and religion reared their head once again. Many of these tendencies were actively encouraged from across the borders, for example in Kashmir, Punjab and the Northeast. This created at times situations where the very unity and integrity of the country was threatened. Indira Gandhi was quick to realise that India would not be able to maintain a sovereign independent stance vis-à-vis the advanced countries if her economy remained weak and dependent on those countries, especially for food. She therefore set about addressing this issue on a war footing. She pushed the ‘Green Revolution’ strategy vigorously and it began to pay immediate dividends. Between 1967-68 and 1970-71, food grain production rose by 35%. Food availability continued to increase sharply to 110.25 million tonnes in 1978 and 128.8 million tonnes in 1984, and food stocks had crossed the 30 million tonnes mark by the mid 1980s, putting an end to India’s ‘begging bowl’ image and creating considerable food security even in extreme crisis situations. Further, the Nehruvian effort at reducing India’s dependence on the external world for maintaining her rate of investment and thus growth, by creating the capacity (mainly through the public sector) to produce capital goods indigenously, was taken forward vigorously by Indira Gandhi. The share of equipment that needed to be imported in the total fixed capital investment in India which was nearly 100% at independence and had fallen to 43% by 1960 was brought down to a mere 9% by 1974. Indira Gandhi was to also expand enormously Nehru’s effort at creating indigenous scientific and technical capacities including in frontier areas like nuclear science. India’s expenditure on science and technology had increased from $1 million in 1947-8 to $1,450 million in 1984. India’s stock of scientific and technical manpower had increased more than 12 times from 190,000 to 2.32 million between 1949 and 1977. The Pokhran nuclear test in 1974 and the launch of the Aryabhatta in 1975 were testimony to the advances made in nuclear and space research. One may add here that unlike many other third world leaders who focused only on catching up in the sphere of science and technology, Indira Gandhi was equally determined that that India should create an independent body of knowledge in the area of the social sciences which would be secular, scientific and nationalist in the sense of being anti-colonial and non Eurocentric and most importantly accessible to all including the poor and underprivileged. It is with this perspective that the Jawaharlal Nehru University was set up in 1969, squashing reported proposals to set up a university in India with a social science focus but with American sponsorship and an English vice-chancellor. The current virulent attack on JNU is testimony to the degree of success achieved in the direction set by its founders. It is the autonomy from the advanced countries in feeding her own population and most importantly in determining her own rate of capital accumulation or growth, including in areas involving high levels of technology, which went a long way in giving India the flexibility to have an independent foreign policy and pursue it with vigour as Indira Gandhi did, to the great annoyance of superpowers like the United States and their acolytes. 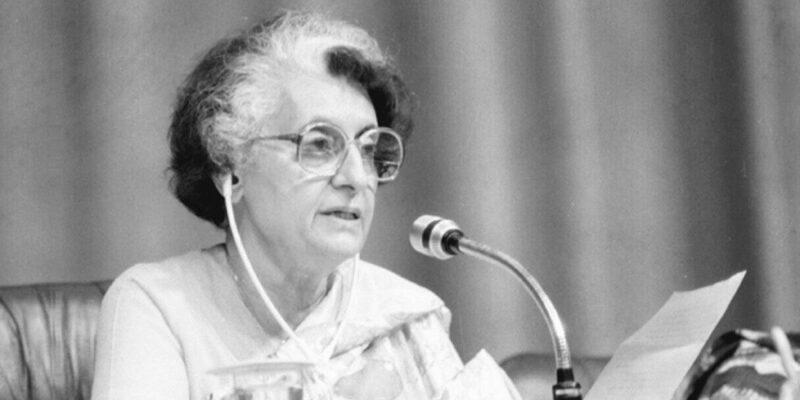 Indira played a leading and dynamic role in the Non Aligned Movement, holding its 7th summit in 1983 under her chairmanship. Her courage in withstanding the combined Chinese and American pressure during the Bangladesh War with the US Seventh Fleet threateningly moving into the Indian Ocean is now a legend. Having, to a considerable degree, promoted self reliance in the economy and asserted India’s sovereignty by maintaining an independent economic and political trajectory, Indira Gandhi was to simultaneously turn towards the third basic element in the ‘idea of India’ of the national movement and in the Nehruvian paradigm – addressing the concerns of the poor. While the land reforms under Jawaharlal Nehru had made considerable headway with feudal zamindaris essentially becoming a thing of the past, the main beneficiaries of the reforms were the upper class tenants or occupancy tenants and not the poor tenants, tenants at will and landless labourers. Indira Gandhi was acutely aware of this and said so publicly. She therefore launched the second wave of land reforms to address the issue. She introduced a series of massive schemes of loans, subsidies, rural employment, etc., for small and marginal farmers and landless labourers so that they too could access credit and key inputs necessary to participate in and benefit from the Green Revolution. For landless Dalits, she introduced an extremely popular scheme for providing them homestead land. Bank nationalisation was one of the important measures among a slew of ‘Left of Centre’ policies aimed at reaching the common man, which were launched by Indira Gandhi. Nationalised banks were persuaded to open branches in backward urban and rural areas and make credit available to small industries, road transporters, self-employed people and of course, farmers. These measures ensured that the Green Revolution did not lead to de-peasantisation (selling out by the small farmers to the big farmers) as was widely predicted, but in fact became the key to their survival. Studies have shown that with the adoption of the new technology, improved seeds and other agricultural inputs, the small farmer became relatively more viable and did not have to sell out to the large farmer in distress. The Green Revolution in fact did not, as predicted by many sceptics, turn into a ‘Red Revolution’ but became one of the most important anti-poverty measures. Eminent economist Raj Krishna reported in 1979 that as a result of the cumulative effect of the various schemes introduced “small farmers, as a class, command more productive assets and inputs per unit of land than large farmers”. Indira Gandhi’s campaign of Garibi Hatao (in place of the prevalent Indira Hatao campaign) was not mere rhetoric as many have argued it to be. No wonder the people of India brought her back to power over and over again, except rejecting her once for the unwise decision to declare the Emergency rather than call for another election. Lastly, Indira Gandhi’s firm resolve to fight communalism politically and ideologically was commendable. She understood, like her father, the dangers of organisations like the RSS to the Indian nation and the “Idea of India”. She therefore refused to fall for the RSS overtures from prison during the Emergency, praising not only her but even Sanjay Gandhi. There was not an iota of anti-Sikhism or anti any other religious minority in her ideology, unlike say the BJP and the Hindutva cohorts, whose raison d’être is being anti-Muslim and anti-Christian. Her risking, and ultimately giving up, her own life by refusing to take the advice of removing Sikhs from her personal body guards with the retort “aren’t we supposed to be secular?” stand testimony to that. 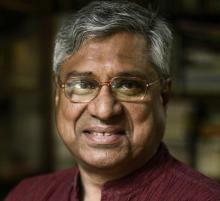 Aditya Mukherjee retired as Professor of Contemporary History, JNU.